I have a short story I would like to tell, its of a Hindu god - Lord Ganesha. Now for the Indians out there who may read this, I certainly do know who Ganesha is and what he represents. Though I will admit I did NOT know what day or month – each year, Lord Ganesha was worshipped (birthday). But from an event which did occur last year 2011, I will now always remember and NEVER forget. On the 1st September which is the ninth month (9 being a sacred number), I was shown that it was (Lord Ganesha’s Birthday) ... which also fell on a Thursday; and again many hold this day as a sacred day of the week. I drove my daughter to the shopping centre where she needed to get a few things. I told her to take her time as I will wait in the car. Now I had no intentions to enter the shopping centre as I was listening to a talk back radio show and felt very comfortable just sitting there. But this was not to be. After some 10 or maybe 15 minutes had passed, I was compelled … and I mean COMPELLED to get out of the car and enter the shopping centre for some unknown reason. I tried hard to ignore this feeling but the harder I tried the more the urge would grow. So I obliged it by getting out of the car and entering the centre. As soon as I entered I looked to my left and saw a beautiful idol of Lord Ganesha sitting on the shelf in a store. It was 18 inches in height which was perfect for where I would sit him. My attention was so attracted to it I was forced to buy it. I handed over the money which was $29, then proceeded to walk away. Just as I was about to exit the shopping centre my daughter catches up to me and asks, what have you got there, dad. I begin telling her that this is Lord Ganesha, he removes obstacles and helps by bringing good fortune to those who deserve it. I had an urge to buy it I told her. Little did I know what was about to happen next. As soon as I told all this to my daughter we both then walked out the front door. Blocking my path was a shopping trolley, as soon as I moved this trolley out of my way, I found a $20 note sitting on the ground in plain sight. Surely others would have seen this it couldn’t be missed. And yet people were coming and going all the time but still not one person saw the $20 note on the tiled floor which was in plain sight. Then my daughter turns and says to me: your right dad, that was a gift from Lord Ganesha, no one else could see it only you. It was meant for you alone. So, the cost of the idol of Ganesha was only $9. It now sits on a high seat in my home where all can see as they enter. Now let me explain the numbers in the story. September is the 9th month (sacred day.) The idol cost $29, finding $20 brought the cost down to $9 (sacred number). Height of the idol is 18 inches, which again shows 1 + 8 = 9. And the sacred day (Thursday). That night I had a beautiful dream of Lord Ganesha along with my chosen form of God. Now let me state something here of great importance which is very relevant to this story. I am not a Hindu - but an Australian born citizen brought up in a spiritual background. I am a lay minister of the Christian faith, ordained and registered with the Attorney General’s Department. Lay means I DO NOT belong to any church. (reasons I keep to myself). 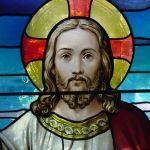 I have loved Jesus from birth, but as I got older it became much more than just a belief, it became part of me in which my whole body, mind and spirit resonated as one with Him. From the intense love and devotion I hold for him in my life, finally gave way where he gave of himself in my dream state, or really it was in the astral that he appeared before me. In my next post I would like to tell of the first meeting I had with Jesus. This might prompt others to write of their experiences also. These posts I offer so others may get inspiration by what they read, and also to show them that WE are never alone. Well, it seems I leaped before I looked once again. Back in September of 2011 - I had already posted the story of my first encounter with the Lord Jesus. So now I will have to post something else of value ??? The manifestations of God is limitless, so is HIS names. Thankyou for sharing your experience with us it was very interesting. My first encounter with the Lord Jesus was not long after i had lost my son at 19 to a motorbike accident. I went to see a medium who told me i had the same gifts as her and i would be working to help others through grief as she had lost two daughters herself. I didnt understand any of this path until i was driving home one today and the clouds were full of faces that i see in the clouds have done since i was a kid, then i saw Jesus he was standing with his arms out he was wearing a white long robe and he was surrounded by a beautiful white aura and i felt so calm and peacefull he was so clear, i didnt know what it meant so i went back to my lovely english medium spiritual teacher lady and she told me Jesus was welcoming me into his service and from there i would be guided onto the path of my purpose and 25 years later of learning and progressing from my spiritual guides and Gods guidance i am doing my spiritual work helping others with not only grief but everyday problems that we all have in our lives it was a wonderful experience knowing i have all that heavenly help and love around me, with me and to give to others. Sometimes we learn more of our gifts only when tragic circumstances strike as it prompts us to look further within ourselves for answers that we would usually ignore. Everything has consequences and for everything there is a reason no matter how painful it may be. My sincere condolences go out to you for your loss, I can only imagine from my own loss the effect it had upon you. My daughter passed at the age of 22, (1994) and in what I was shown at her funeral to ease my grief was astounding to say the least. Jazz, NEVER give room for doubt concerning the face of Jesus in the clouds, because later doubts might settle in. What Grace you were given for Jesus to do this. I had doubts once in the things I was shown and given, though it was only later that the doubts I held onto was swept away by His Love. Thank you very much for telling this as I know others will benefit from it - and God bless you. Anyone who is able to cope with the loss of their child deserves the highest reward in Heaven. I knew Jazz lost her son but Solo I am shocked to find out that you too lost your daughter. Gosh you people are remarkable in my eyes to be able to cope with that, my heart goes out to you both. God bless you Truthseeker for such beautiful heart felt words.